Be careful whom you wake up with morning aspirations and hashtags. Tread softly, as the saying goes—unless, of course, you’re Stonyfield yogurt. They know their organic tribe and their tribe loves them back in every store aisle and social media venue. During May-June 2013, the lid of each individual yogurt cup covers extends a warm invite to a cool and creamy brand experience. Both the message and the product do your heart good. Note: If you’re the caffeine-first kind of Joe or Joanna, none of this applies. Here’s my classic Starbucks post for you. 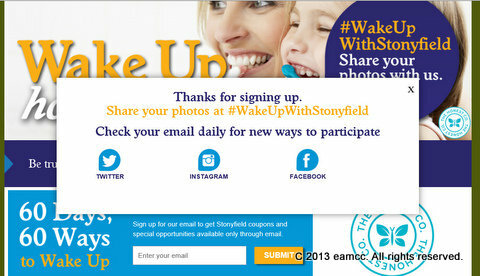 #WakeUpWithStonyfield gets it just right in this May-June 2013 campaign. Rather than being intrusive, it engages an already loyal community to spoon deeper and share the experience on Pinterest and other sites. The clarity of the call to action is also empowering. “60 Days, 60 Ways” is just long enough to experience the healthy difference a cup of Stonyfield yogurt can make in your life. If you’ve gone so far as to consider or make the purchase, the rest is easy (read: conversion pipeline). In fact, the campaign found its roots in the community, blogs Amy VanHaren, Stonyfield’s Social Media Manager. It’s a classic new brand story of people with aspirations seeking the brand that matches. Before the Stonyfield yogurt goodness touches your lips, you’re engaged. In “What if Means to Me to Wake up Happy with Stonyfield,” Amy describes all the inbound enthusiasm. So the campaign isn’t intrusive at all and you can leave all the permission marketing behind. Stonyfield followers own and love their brand and the experience it offers. They certainly fit the product and packaging. The promise is implicit: Start your day with Stonyfield and you’ll be healthier and happier. That’s a culture we’d all like to be part of. As Amy reported, the aspirations (hopefully) were already finding their way into the days of Stonyfield lovers. The social media simply made it easy to share the photo-good-news via Twitter, Facebook and Pinterest. The tag line and call to action become one—#WakeUpWithStonyfield. And if that’s not enough, there’s a message inside. Of course you’re going to spoon the creamy topping from the back of the label and what do you find—a simple description of how the campaign works. Stonyfield even rewards your brand loyalty with special coupons. I have to admit, I look forward to getting my daily email. It’s a way to add a little creativity and inspiration to my day. What more could a brand ask for?